Bronte beach at the Bondi to Coogee walk and is great for swimmers and surfers alike. Bronte Beach is very scenic it makes for a nice getaway for the whole family. Bronte Beach is popular with surfers despite the often rough surf. You can swim at the 'bogey hole', a 30 metre ocean pool rock pool towards the southern end of the beach if you find the surf too challenging. Bondi to Bronte walk is one of the most popular walks in Sydney and one of the best Sydney's locations for photographing sunrises. 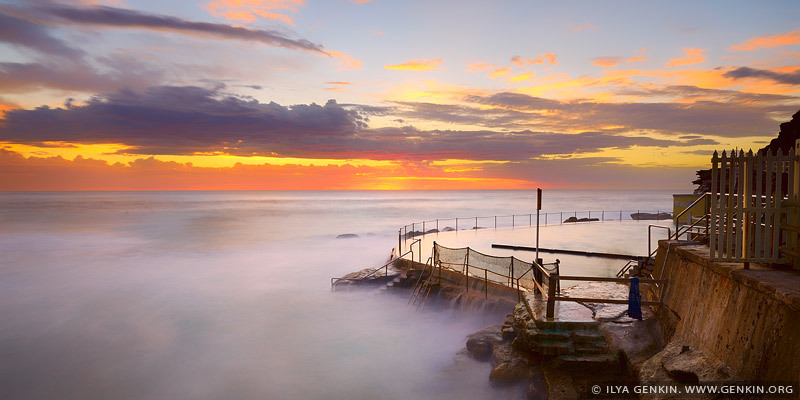 This image id AU-BRONTE-BEACH-0003 of Beautiful Sunrise at Bronte Baths, is copyrighted © by Ilya Genkin. This is not a public domain image.